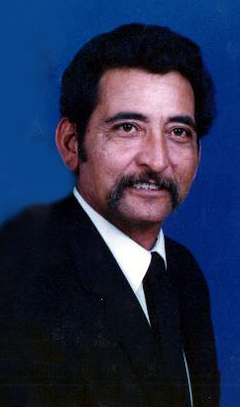 Rosary for Juan Alvarado Sr. 72, of Tahoka will be held 7:00 P.M. Tuesday, October 16, 2018 at Calvillo Funeral Home Chapel in Tahoka. A Funeral mass will be celebrated for Mr. Alvarado at 10:00 A.M., Wednesday, October 17, 2018 at St. Jude Catholic Church with Father Eduardo Teo officiating. Burial will follow at Nevels Cemetery under the direction of Calvillo Funeral Home. Juan was born April 3, 1946 in Charlotte to the late Isidro Sr. and Erlinda Alvarado, he passed away on October 14, 2018 in Tahoka. On September 16, 1962 he married the love of his life Tome Barrientez. Juan had various hobbies especially trying his luck in casinos and traveling, however; one of his greatest joys in life was being around his family. Juan retired from Lyntegar Electric after twenty years of service. He then purchased Tahoka Auto Supply in 1988 and in 2000 he purchased One Stop Burritos, but his passion was to farm, in 2003 he purchased some farm land and started to grow cotton. He served as the president of the Men’s Organization of St. Jude Catholic Church from 1993 till 1996. He is preceded in death by his parents; brothers Manuel Alvarado, Isidro Alvarado Jr. and a sister Stella Rodriguez. Survivors include his loving wife Tome Alvarado of Tahoka; a son Johnny and wife Kim Alvarado of Lubbock; three daughters Sarah and Husband Tony Garcia of Tahoka, Maggie and husband Ruben Trevino of Lubbock, Lydia and husband Will Gutierrez of Lubbock; a brother Joe Calvillo of Tahoka; sisters Eva Calvillo of Lubbock, Florinda Rodriguez of San Antonio and Helen Saldana of Tahoka; eight grandchildren and seventeen great grandchildren.